There is way more parking than people in Prince George’s. Why are spots sometimes hard to find? Parking in Upper Marlboro takes up space. Image by the author. Is there enough parking in Prince George's County? 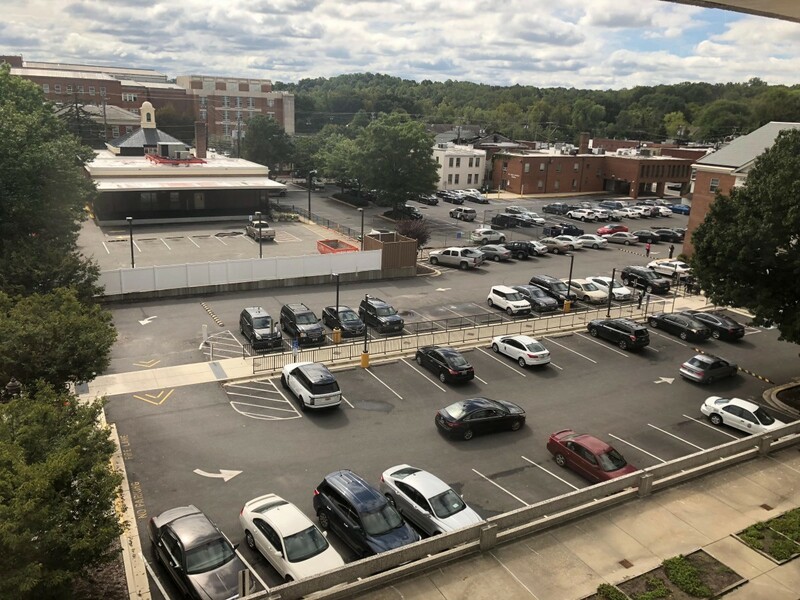 It’s common to hear residents decry the perceived lack of parking, usually along with some anecdote about driving around for half an hour looking for a parking spot or having to wait in a lot for someone to leave, but is this the norm or the exception? Prince George’s County shares all of its GIS data online and information can be quickly mapped on PGAtlas, the county’s online mapping tool. I've used this to find the total acreage of parking in the county. A screenshot from PGAtlas.com impervious surface layer shows parking lots and roads (gray) and buildings (brown) in Largo. Fed Ex Field is on the left. The data show approximately 10,892.54 acres of land dedicated to visible parking lots. Keep in mind that this is an approximation using satellite imagery, so underground parking, lower levels of parking garages, grass field parking lots, street parking, and household driveways and garages are not included. The data is also from 2014, so there may have been changes since then. Prince George's zoning code indicates that the minimum size for parking spaces is 9.5 by 19 feet. If each space also includes one lane’s worth of drive aisle space, every parking space takes up about 285 square feet. A parking space and the drive aisle needed to access the space require 285 square feet. At 285 square feet, there are 1,664,838 at least parking spaces in the county. The actual number is likely much higher as this doesn’t include the parking areas listed in my qualification above (e.g. household garages and driveways). It also doesn’t take compact spaces into account. Census data show that Prince George's has 912,756 residents and Maryland Vehicle registration data show that there were 696,608 registered vehicles in the county in 2017. That means there are 1.82 parking spaces per resident (regardless of whether they drive or not), and 2.39 parking spaces for every vehicle registered in Prince George’s. So, there should be enough parking for everyone. It’s not the amount of space that’s dedicated to parking that matters so much as how that space is used. If it’s difficult to find parking (or if there are an overwhelming number of free spaces), that’s an indication that it is not managed as well as it should be. Fortunately, there are lots of successfully-tested approaches to manage parking. Unfortunately, many of these practices require motorists to pay for the parking they use or to change their behavior in some way. One of the most common parking management methods is to charge motorists for parking with parking meters, parking garages, valet parking, etc. If a motorist knows that it costs more the longer they are parked, they are more likely to stay in a spot for a shorter amount of time, thus increasing the availability of parking spaces. If there are still no free spaces, it’s an indication that the fee for parking is too low. The goal of good parking management should be to ensure that there’s always a percentage of available spaces. Another approach is to address the underlying land-use problem. Parking is only an issue if many people are dependent on driving to reach their destination. If a jurisdiction’s zoning code permits a mix of uses such as allowing a café near homes, then it is likely that some of the people who visit that café will do so by means other than an automobile, such as walking, bicycling, or transit. That also frees up parking spaces. Other strategies to help manage parking supply include prioritizing carpool parking spaces, using off-site parking in combination with a shuttle, restricting parking on residential streets with permits, and unbundling the cost of parking from housing. Employers can provide transit, walking, or bicycling subsidies, and also participate in parking cash-out programs. Prince George’s County is continuing to grow and urbanize and work towards its general plan. As it considers a new zoning ordinance and builds the Purple Line, more and more attention will be paid to the tensions between having a place to park and having a place worth visiting. Bryan Barnett-Woods is a transportation planner in Prince George’s County with the Maryland-National Capital Park and Planning Commission. In addition to bicycling and rowing, Bryan likes nothing more than a good walk in the city. He lives in Barney Circle with his wife and young son. The opinions expressed in this post represent Bryan’s opinions only and do not represent the opinions of his employer. What Metrorail station is between Archives and Mt Vernon Sq on the Yellow or Green Line? Feel free to ignore station subtitles.